On 23rd May 2017, VNU University of Economics and Business (UEB) held the international conference on "Some international theoretical issues and experiences in building, management and development of cross border economic zones (CBEZ)". Attending the conference, there were Dr. Hoang Xuan Hoa - Director of Economic Affairs, Central Economic Committee, Mr. Tran Duy Dong - Director of Management Department of Economic Zones, Ministry of Planning and Investment; Dr. Nguyen Van Hoi - Deputy Director in charge of Department of Border and Mountain Trading, Ministry of Industry and Trade. The conference was attended by international guests - Mr. Yuebin Zhang - senior expert in regional cooperation, Asian Development Bank (ADB). From the VNU University of Economics and Business, there were Assoc.Prof.Dr. Nguyen Truc Le - Vice Rector in charge, Dr. Nguyen Anh Thu - Vice Rector and Head of the Project. The conference also attracted participation of researchers, experts, lecturers and students from research institutes and universities. In the opening speech, Assoc.Prof.Dr. 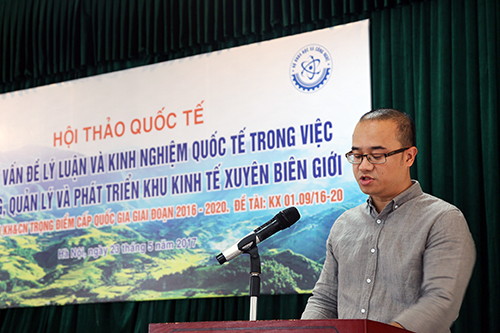 Nguyen Truc Le welcomed experts, researchers and representatives of management agencies for attending the conference. He also introduced to participants about objectives of the conference and research projects being undertaken by the UEB. 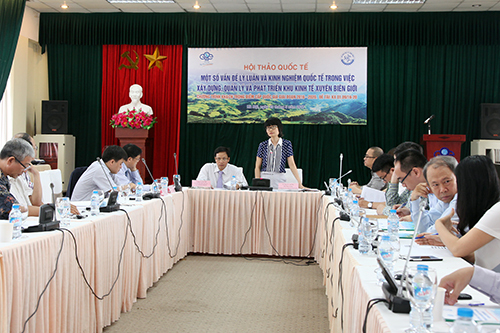 At the conference, Dr. Nguyen Anh thu presented the discussion on "Models and theoretical issues related to CBEZ". In the presentation, Dr. Nguyen Anh Thu introduced some views on the cross-border economic cooperation zone, some theoretical models that seemingly most comprehensive as well as the need of building cross-border economic zone. The projects also offered some suggestions on the construction of a cross-border economic zone suitable for Vietnam and its neighboring countries. Later, Mr. Yuebin Zhang discussed the topics of "The role of special economic zones in the development of economic corridors in the GMS region". The discussion mentioned theoretical issues on economic zones, the border economy, the practical cross border economic cooperation in the Greater Mekong Subregion. Especially, he highlighted the project “Border economic zone in Guangxi, China” supported by ADB. 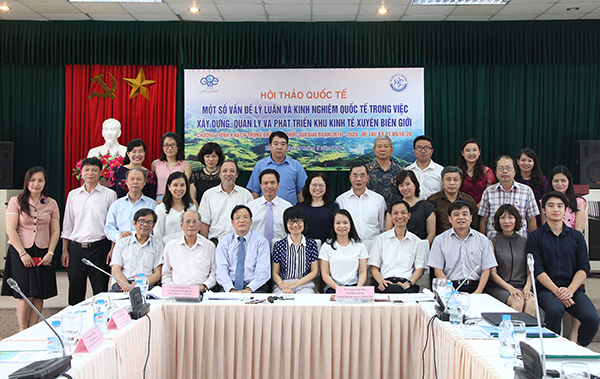 At the conference, participants also listened to discussion of Dr. Nguyen Van Hoi on “Policy recommendations for management and development of border economic zones of Vietnam" and presentation of Dr. Nguyen Quoc Viet on "CBEZ formation conditions: international experiences and lessons for Vietnam". The conference received valuable contributions and feedback from participants. Experts and researchers noted that this was an open topics with huge practical value. Results of the project will help the government to answer the real question of should or should not build the cross-border economic zones, in what form and what is the management mechanism? Comments and contributions of participants mentions various aspects of the topics, including: the necessary to build CBEZ (from economics, society and environment’s viewpoints), current models and proposed models for CBEZ, suitable management mechanism with the economic zones etc.